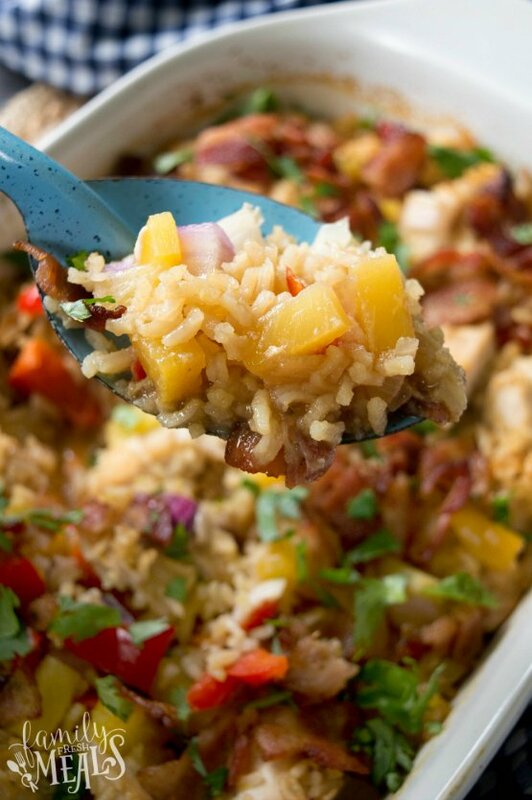 A super easy one-pot meal with a Hawaiian flair. 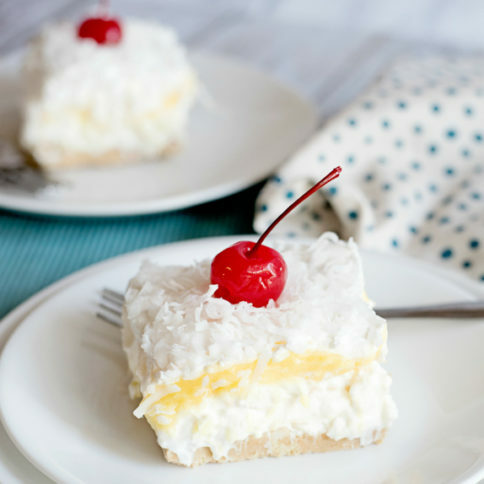 Ever notice how you can make anything taste Hawaiian by putting pineapple in it? I’ve already used this trick a couple of times with chicken, once in a Crockpot Hawaiian BBQ and once in a foil packet dinner for the grill. 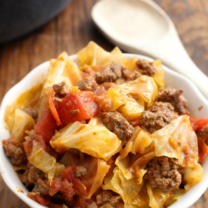 And those are both good, but neither one is a true one-dish meal – something you can just pop on the table and serve, with no need for side dishes. 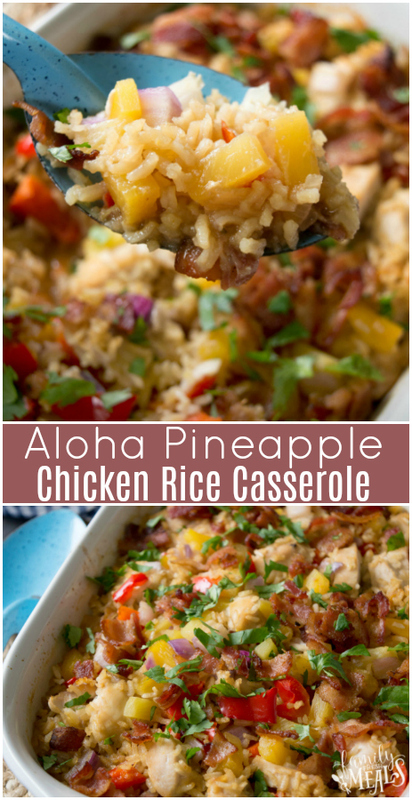 This Aloha Pineapple Chicken Rice Casserole fills that need. 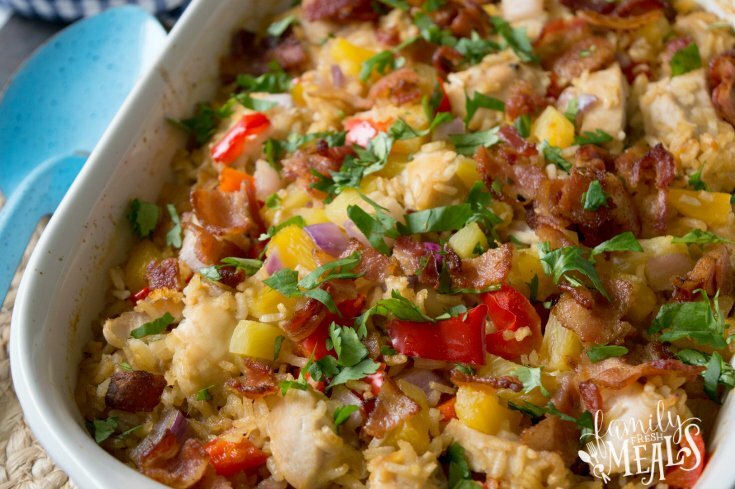 It’s got all the makings of a meal – chicken, rice, and veggies – in one casserole dish. 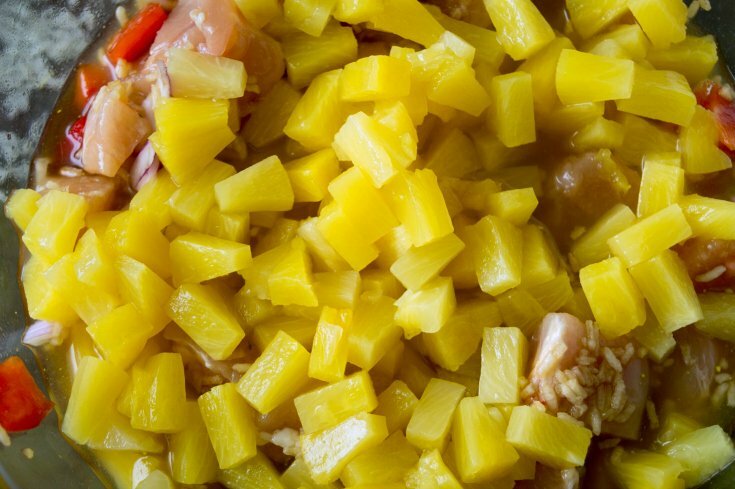 And it’s all swimming in a tangy, salty-sweet pineapple sauce that gives it a real Hawaiian flavor. Better still, it comes together in no time. 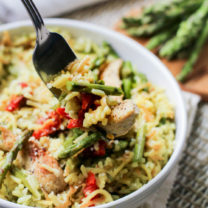 You use instant white rice in the casserole, so you don’t need to cook it first – just throw it in the dish with the veggies, chicken, and sauce, and it cooks up right in the pot, soaking up the juices of the chicken and sauce as it softens. So instead of being just a lump of bland white starch on the side, the rice is every bit as flavorful as the meat and veggies. 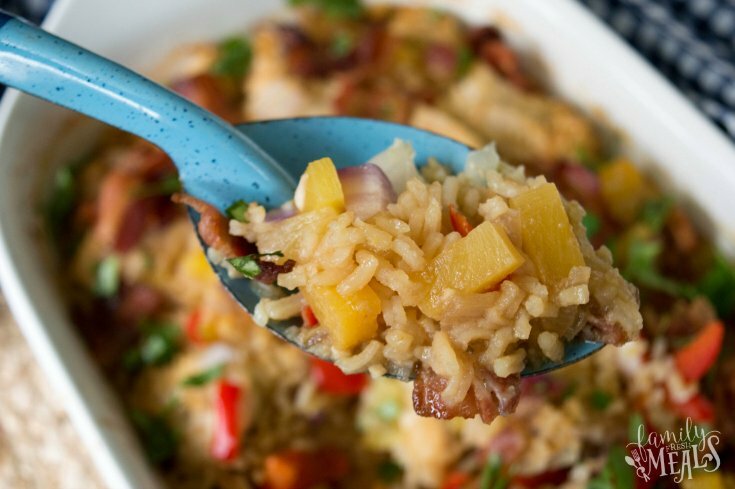 Whipping up a batch of this Aloha Pineapple Chicken Rice Casserole is the fastest and easiest way to whisk yourself away to Hawaii for an evening. 1. Preheat oven to 425 degrees F. Spray a baking dish with cooking spray. I used an 11 x 7-inch dish. 2. 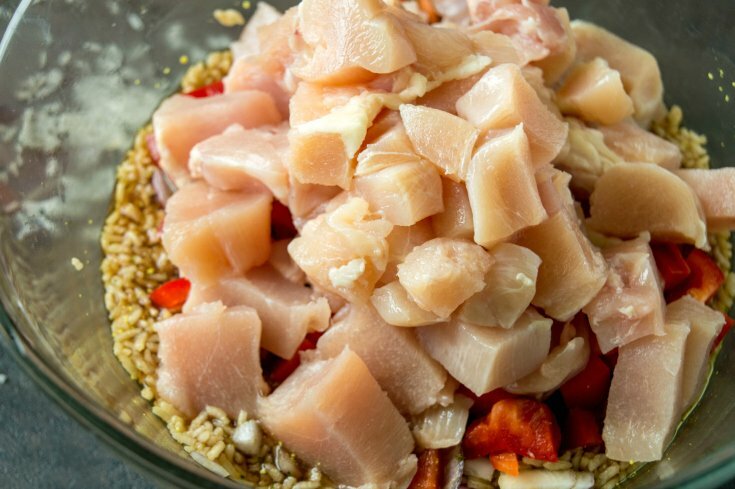 In a large bowl, whisk together brown sugar, soy sauce, garlic, and chicken broth. 3. 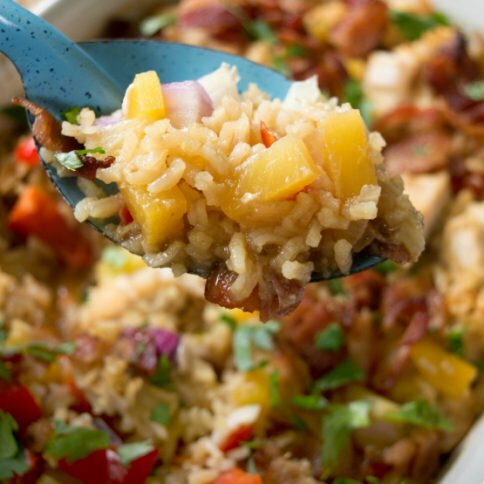 Add uncooked rice, onion, bell pepper, pineapple and it’s juices and chicken. Cover the baking dish tightly with foil. Bake for 20 minutes. Once cooking is done, uncover and stir ingredients. 4. 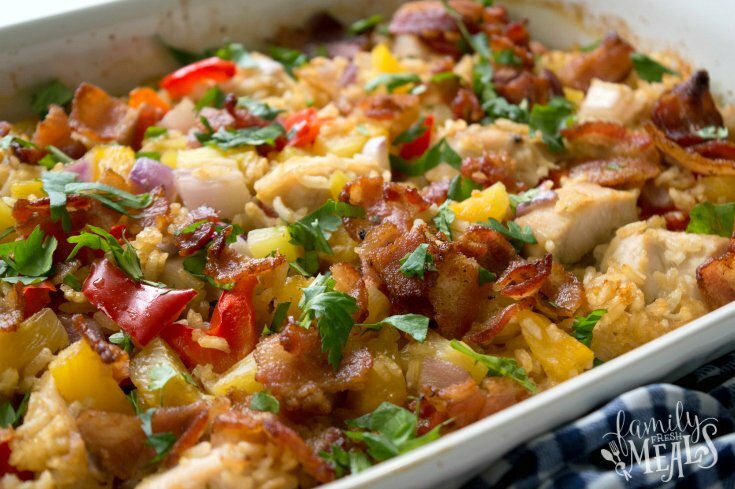 Return the dish to the oven, uncovered, and bake for an additional 10 minutes, or until chicken is cooked through and rice is tender. Let stand 5 minutes before serving. Top with diced bacon and cilantro. Return the dish to the oven, uncovered, and bake for an additional 10 minutes, or until chicken is cooked through and rice is tender. Looks awesome! Pinning this one for later! Looks delicious! 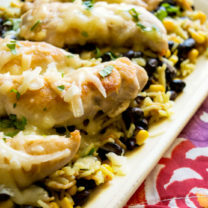 Can I use a brown rice/quinoa blend? 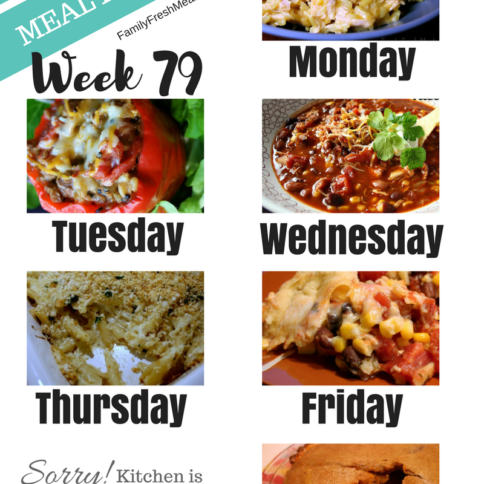 Could you make this in the crock pot? If so, would you do the same, esp. the rice? Time and temp? Sounds delicious! Definitely pinning and trying this one. Thank you! How can this be made with non instant brown rice? Pam, I have only made this recipe as written, so I cannot say for sure. If you do try the brown rice, please let us know how it turns out! Such a delicious meal! love the little bits of pineapples, cilantro, and the crunch of the bacon. Wow! Defetnely making this again. Thaks for the great recipe! I had normal rice and cooked mine 10 minutes longer than directed uncovered and it turned out fine. This was delicious! Passed the recipe along to my sister in law who made it the same night too and loved it. Thank you! I had a question on what kind of minced garlic are you using? I use dry minced garlic in a jar, what would be the equivalent be? I used fresh garlic minced. You can substitute 1/2 teaspoon garlic flakes for every clove. I use dry minced in a jar. What kind do you use & what would be the correct equivalent?